We are a leading Supplier & Manufacturer of Housekeeping Brushes. Our wide range of Housekeeping Brushes includes Kulphy Tube Cleaning Brush, Spindle Cup Brush, Condenser Tube Cleaning Brush, Boiler Tube Cleaning Brush and Cup Brush. These are specially designed by our team of professionals who understand the household requirements. With the help of our experienced professionals, we have been able to offer a wide range of Spindle Cup Brushes. These brushes are fabricated under the surveillance of experts, who make use of quality raw material and innovative techniques in manufacturing. 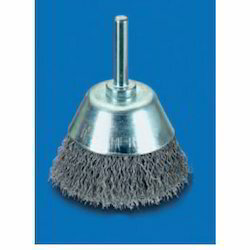 The brushes offered by us are widely used for cleaning industrial machinery. Owing to the features such as fine finish and rigid construction, these brushes are widely applauded among the patrons. Looking for Housekeeping Brushes ?